Trends are not only for the fashion world; they are common in the housing market too. And just like fashions keep changing with seasons, housing trends vary according to the economic environment. 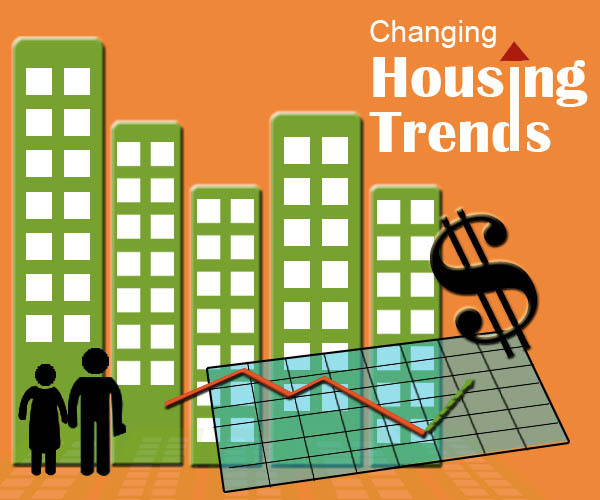 Let’s take a look at the top housing trends for 2013. As 2012 came to an end, the housing market was 47% back to normal, which was a welcome sign. About 1.3 million homeowners with negative equity were rescued by the increase in housing prices in the second quarter of 2012. We hope to see the trend continue this year. We are also seeing that homes free of big mortgages are easier to sell. Also when there is a surge in prices, people will definitely look to buy before the prices go sky high. Consumers and market experts expect mortgage rates to rise as the national economy improves. This will in turn reduce home affordability. So, people planning to buy a home this year, should hasten. If you are thinking, “Will prices rise enough so that the for-sale inventory will start expanding again? We say that the rising prices should lead to more inventory because, “rising prices encourage new construction and encourage some homeowners to sell.” But that would be something to wait and watch. Another sign of recovery, the ‘Nationwide-housing Crisis’ has started becoming a more localized, ‘State/Region wide housing crisis’. Looking at the trends at the start of the year, we all hope to see the housing market flourishing as 2013 unfolds. This entry was posted in Uncategorized and tagged Changing housing trends 2013, Housing Prices, Housing Trends 2013, Mortgage Rates 2013. Bookmark the permalink.